Offering you a complete choice of products which include soap mould for mill 6 stamping machine, soap mould for mill 4 stamping machine and soap mold for mill stamping machine. Our reputation in the market is largely attributable to our precision-designed Soap Mould for Mill 6 Stamping Machine. Provided soap mould is manufactured by our proficient professionals using quality tested raw material and innovative technology. Moreover, our quality examiners check this soap mould on various quality measures. Owing to its varied quality attributes like rust free and sturdy structure increase its needs in the market. We are instrumental in providing our clients a comprehensive range of Soap Mould for Mill 4 Stamping Machine. Our offered soap mould is available in variegated sizes and designs as per the requirements of our prestigious clients. Our skilled professionals manufacture this soap mould using quality tested raw material and ultra-modern technology. 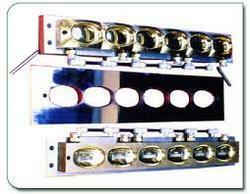 Furthermore, this soap mould is highly acknowledged in the market owing to its various quality features. We are the leading manufacturer and supplier of supreme quality Soap Mould for Mill Stamping Machine. The offered soap mould is manufactured by our adroit proficient in adherence with industry quality standards using superior quality raw material and innovative technology. The offered soap mould is tested on varied quality parameters in order to delivering qualitative grade at clients’ end. 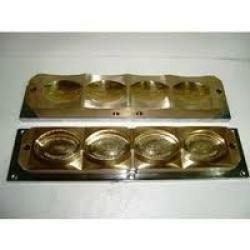 Apart from this, customers can avail this soap mould in different specification at nominal prices. Looking for “Soap Mould for Mill Stamping Machine”?